Publicity…is it a science, or an art form, or just plain dumb luck? Whatever it is, if you’re an author, you need it, and you need it bad. Writing a great book just isn’t good enough. “If you build it, they will come” is a philosophy designed to crash and burn in the publishing industry. If readers don’t truly love your book, then a massive marketing campaign won’t save it. But if readers do love your books, you still have to work hard to spread the word and find new readers. 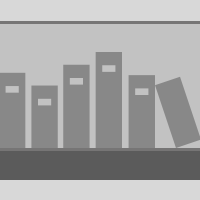 It used to be that readers found books on bookstore shelves, but book stores are rapidly disappearing, and truth be told, indie authors were never really welcome in most book stores. Fortunately for indie authors, the internet is the new book store, but this raises a whole new set of challenges. By some estimates, Amazon has over 1.7 million titles, so how do you keep your book from being a proverbial needle in the cyber haystack? Smart publicity is the answer. These days authors need to find readers, not the other way around. Think about your target audience. Who reads your kind of books? Better yet, who loves your kind of books? Start with successful authors who write books similar to yours. Follow these authors on the internet to discover what they do for publicity. Study their readership and seek innovative ways to find them. Imitate success but also strive to be innovative, putting your own twist on your approach to publicity. Start early! The sooner you start promoting your book, the better. Authors need to build an audience before their book is published. This might sound like putting the cart before the horse, but major publishers promote their authors for over a year in advance. If it’s important for the majors then it’s doubly critical for indie publishers. 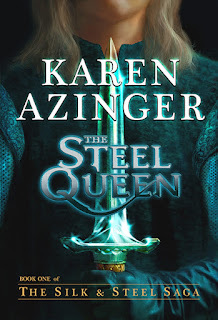 For The Steel Queen, I started two years in advance with Facebook and then progressed to a website and other forms of social media. Be creative, be entertaining, and use the social network to spread the word. A picture is still worth a thousand words. Eye-catching artwork, even when reduced to a postage-stamp size, is the very best publicity tool an indie author has. A cover is your calling card on Amazon, on Facebook, on your website, so make sure it’s a great one. 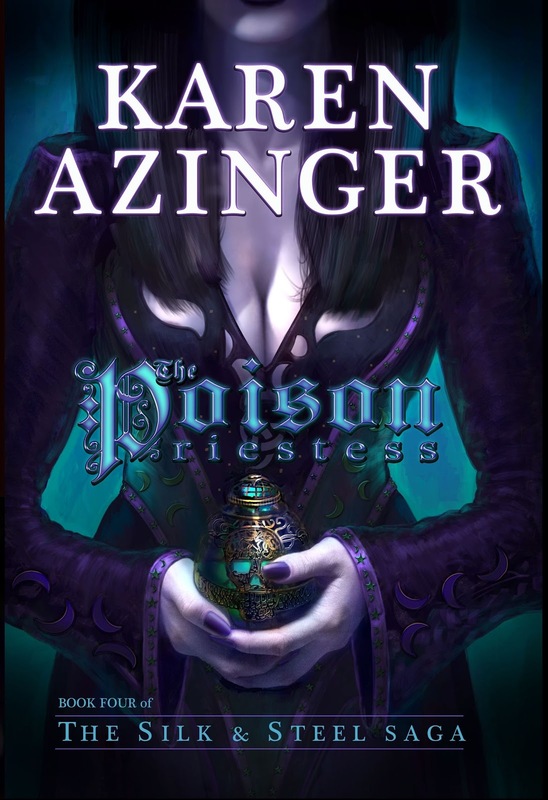 Covers should look professional and they should reflect your genre with a single glance. Commission your cover as soon as possible so you have it for advance publicity. Word-of-mouth is still king when it comes to selling books, so encourage your readers to write and post reviews. 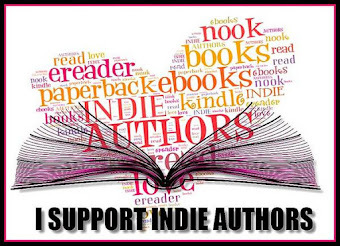 The best gift a reader can give an author is a review, but indie publishers also need professional reviews. Search for book reviewers on-line and offer them a complimentary copy for an honest review. Unfortunately major publishers are flooding established reviewers with their books (proving how important reviews are). Indie publishers often need to discover new emerging reviewers. Once a review is posted, multiply its value by spreading links through the web. Giveaways are a great publicity tool. 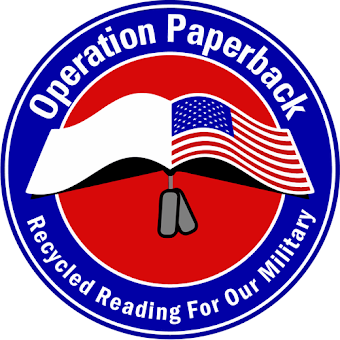 Like all publicity, the objective is to get more readers aware of your book. 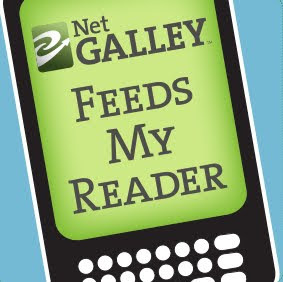 Authors should use giveaway programs with the broadest reach. 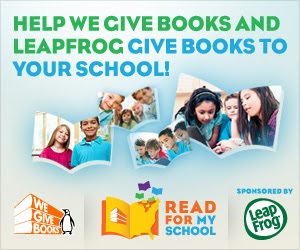 I use Goodreads because they reach ten million readers with romance and fantasy as their top genres. They also let authors choose the countries eligible for the giveaway. It may mean more postage, but authors should select every country where their e-book is sold in order to get the most bang for their book. And last, but not least, keep writing. The more good books you publish, the greater your chance of success. 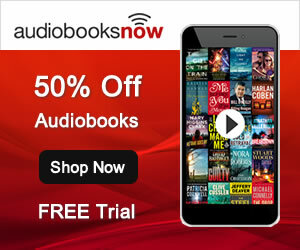 Write a saga or a series and publish new books at regular intervals. Keep writing good books and your audience will multiply. Publicity is tricky and it’s hard work, but it’s a necessary part of success. I call it “rolling the snowball”. I keep trying to add more readers and build momentum for my epic fantasy The Silk & Steel Saga, hoping that one day the snowball will take off and roll by itself. Best of luck to you! 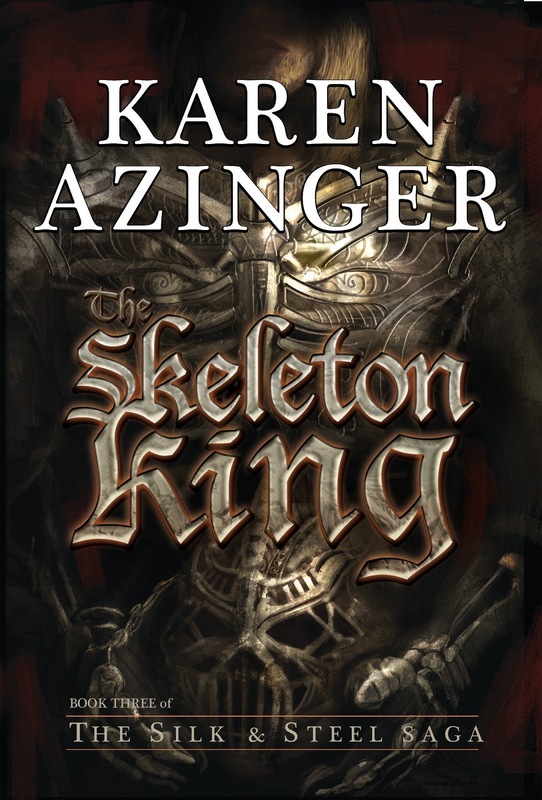 Karen L. Azinger has always loved fantasy fiction, and always hoped that someday she could give back to the genre a little of the joy that reading has always given her. Ten years ago on a hike in the Columbia River Gorge she realized she had enough original ideas to finally write an epic fantasy. She started writing and never stopped. The Steel Queen is her first book, born from that hike in the gorge. Before writing, Karen spent over twenty years as an international business strategist, eventually becoming a vice-president for one of the world's largest natural resource companies. She's worked on developing the first gem-quality diamond mine in Canada's arctic, on coal seam gas power projects in Australia, and on petroleum projects around the world. Having lived in Australia for eight years she considers it to be her second home. She's also lived in Canada and spent a lot of time in the Canadian arctic. She lives with her husband in Portland Oregon, in a house perched on the edge of the forest. The first four books of The Silk & Steel Saga have already been written and she is hard at work on the fifth and final book. In a medieval world of forgotten magic, mortals are lured to the chessboard of the gods where an epic struggle of lives, loves and crowns hang in the balance, yet few understand the rules. In this game of power, the pawns of light and darkness will make the difference in the battle for the kingdoms of Erdhe: Katherine, 'The Imp': a young princess with the stout heart of a warrior will challenge the minions of a thousand-year-old evil. Liandra: The Spider Queen; who uses her beauty to beguile, her spies to foresee, and her gold to control, will need all of her skill and strength to fight a rebellion with her own blood at it's heart. 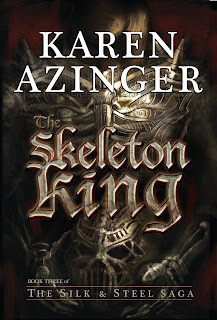 Steffan, the puppeteer, will corrupt the innocent and unwary with greed and desire, as he sets an entire kingdom ablaze. Heralded by a red comet, the Mordant is Reborn. A thousand years of evil hidden beneath a young man’s face, the Mordant returns in the guise of his oldest enemy. Keen to regain his full powers, he weaves his way north, sowing a trail of death and deceit. Kath and her companions leave the monastery, chasing an elusive shadow across the kingdoms of Erdhe, but the dark divide has already begun. Allies are set against allies, tearing the kingdoms asunder. A rebellion rises in Lanverness, threatening the queen’s life as well as her crown. Trapped within her own castle, the Spider Queen must out-wit the traitors led by her own blood, or surrender her kingdom to Darkness. Across the border, the Lord Raven builds a religion into a fanatical bonfire. A fiery frenzy grips Coronth, fanning the powers of the Flame Priest into a raging threat. The eternal battle of Light and Dark is joined, but few mortals understand the rules. Destinies collide in the far north. Kath and her companions chase a trail of death across the steppes. The endless grassland seems benign, but they soon fall prey to an ambush of tricks and traps. Swords alone will not avail them, for the north is guarded by the foulest magic. The companions must rally, each of them tested in a crucible of choice. War drums thunder across the steppes. The Mordant ascends the Ebony Throne, loosing his hordes against the Octagon. The steppes become a bloody battlefield, with victory and loss on all sides. One age is ended but another begins. Born of blood and deceit, the new age threatens to be full of Darkness unless a few dare to make a difference. While Kath and her companions chase the Mordant into the far north, the southern kingdoms erupt in Flames. The Lord Raven marches south, unleashing a holy war against Lanverness. Vastly outnumbered by a ruthless enemy, Queen Liandra spins desperate gambits in a dire struggle to save her kingdom. New alliances and new awakenings hatch deeper levels of intrigue. 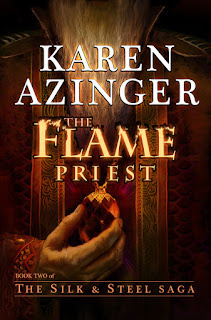 The Oracle Priestess and the Lord Raven form a tenuous alliance, while deep in the Southern Mountains the Kiralynn monks stir, revealing more than prophecy. Armies clash, battles rage, and cities fall, as lives, loves and crowns hang in the balance, but swords are not the only way to wage war. Treachery, deceit, assassins, and the power of seduction will face-off against steadfast courage, forgotten magic, and the power of truth. 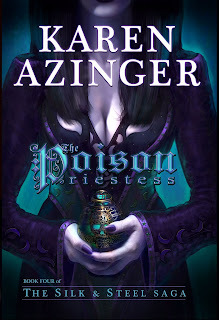 The Poison Priestess is the fourth book in this epic tale of Light versus Dark.